Bansuri Guru. Learn to play the North Indian Bamboo Flute. 2 Multimedia CD - ROM Set. A part of the Music Without Boundaries series. CD - 1 : Bansuri Guru. CD - 2 : Indian Art Music. Note : The Bansuri Guru, was designed for Windows 95. May or May NOT work on other Windows Operating Systems. Eastern Harmony brings you the Bansuri Guru directly from the Maestro Pandit Hariprasad Chaurasia. The Bansuri Guru is a unique multimedia title designed to help you begin your journey into Indian Art Music and the Bansuri. This step-by-step learning guide is an essential resource packed with extensive audio, video and textual guides, as well as extensive exercises and self-tests. An accompanying reference CD - ROM on Indian Art Music with an additional 60 minutes of audio, 15 minutes of video and an extensively researched guide to the style, evolution and theory of Indian Art Music. From his world music contributions to his personal anecdotes, you will embark upon a journey that leads you from an overview of Indian Music to learning the nuances of playing the Bansuri. The Bansuri is striking in both its simplicity and richness. Originally a Folk Instrument, the Bansuri has evolved a dazzling repertoire and found its way into Contemporary Jazz, Fusion and World Music Scene. This step-by-step learning guide is an essential resource packed with extensive audio, video, and textual guides as well as extensive exercises and self-tests. The Bansuri Guru can start you on your journey or compliment your existing instructions in learning about India's contributions to World Music. If you are an educator, student, professional or just a curious individual, the Bansuri Guru will be certain to capture your senses in a way that no other multimedia presentation has ever done. 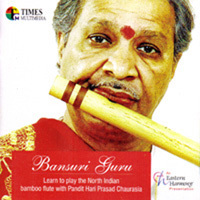 In the Bansuri Guru you will learn directly from the Maestro Pandit Hariprasad Chaurasia. Chapters created by the world renowned Maestro Pandit Hariprasad Chaurasia. Progress through 11- Chapters designed for step-by-step learning. Exercises designed by Bansuri Experts for each chapter. Recordable Self - Tests of gradually increasing complexity to access your progress. Print capability for all textual content and exercises. 43 minutes of instructional video demonstrations and 40 minutes of audio clips. A discography of Pandit Hariprasad Chaurasia's recordings. Audio and Video supplemented by 110 pages of exercises and instructional material. Glossary with pronunciations of 120 Indian Music Terms. An accompanying reference CD - ROM on Indian Art Music with an additional 60 minutes of audio, 15 minutes of video and extensively researched guide to the style, evolution and theory of Indian Art Music. No prior knowledge of Music required. Indian Art Music, is a multimedia guide packed with information on the styles, evolution and theories of Indian Art Music. This accompanying reference CD-ROM is based on extensive research of eminent musicologists including Dr. Ashok Ranade and Dr. Adan Mistry. It accompanies the Bansuri Guru to provide a foundation for learning the Bansuri. Art Music or Indian Classical Music, as it is more widely known. The Indian Art Music CD-ROM provides an informative companion to learning Art Music, specifically North Indian or Indian Art Music. It includes theory on concepts such as raga and tala, the profound and ancient history of Indian music, its various styles and types of musical instruments. It also provides extensive information about the bansuri and the tabla. You can learn about the history of the Bansuri, its relationship with the Indian Mythology and its progression to mainstream Art Music. You will also learn more about the six major tabla gharanas as well as some of the great tabla maestros. In all, its extensively researched content includes an additional 60 minutes of audio, 15 minutes of video and a 120 word audible glossary of terms related to Indian Music. Internet Explorer 3.02 or Higher. At least 16 MB RAM. 640 x 480 Display, 65,000 Colors. 16 bit sound card and speakers. Printer to print out exercises. Additional free hard drive disk space to store all your work.